Description: An eastbound train rolls into Dothan as it heads for Waycross GA. Description: Once we got into Sebring, we had to wait a few hours to catch P89 to get to Dade City. 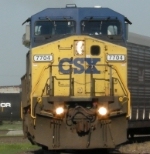 When we were waiting there, a CSX mixed train came by. Description: 7704 gives us a roster shot while working on pusher duty at fulton. Description: H218 pushers are shoving hard on the rear of the N305 to get him up da hill from fulton yard. Description: Mixed freight heads west past Depot Street. Description: BNSF 5256 leads another westbound autorack train (CSX Q261) which is hot on the heels of CSX Q217. Description: K655 westbound at Amsterdam. Description: The southbound Juice Train heads past the Buckingham Branch Railroad's yard at Doswell.